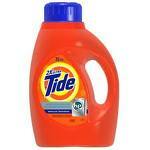 Enter here to win a year’s worth of Tide HE. A drawing will be held each week for 57 weeks. And the weekly winner will receive a one-year supply of Tide HE awarded as a booklet of 10 free product coupons (each coupon booklet up to $80 value). You can enter daily until February 29, 2012. Let me know if anyone wins!